Slovenia is a country in Central Europe, touching the Southern Alps and the panonian flat region and bordering the Mediterranean. The country has a wide variety of landscape, vegetation and climate, and situated as it is at the heart of the continent, it has always been a junction for communication links between the south and north and east and west Europe. Slovenia is a parliamentary republic with a total area of 20,273 sq.km, and has a population of 2,061,952, (1.4.2015). Around 40% of Slovenia's land mass is elevated land - mostly in the form of mountains and plateaus - which is located in the interior regions of the country. The highest point of Slovenia is the 2,864 metres (9,396 ft) high Mount Triglav, the lowest point is the Adriatic Sea at sea level. Slovenia has borders with Italy on the west, the Adriatic Sea on the southwest, with Croatia on the south and east, with Hungary on the northeast, and with Austria on the north. The overall length of the state border is about 1,370 km. The capital and largest city of Slovenia is Ljubljana. Slovenia has been part of the Roman Empire; partly the Republic of Venice; the principality of Carantania (only modern Slovenia's northern part); the Holy Roman Empire; the Habsburg Monarchy; the Austrian Empire (later known as Austria-Hungary); the Kingdom of Serbs, Croats, and Slovenes (renamed to Kingdom of Yugoslavia in 1929); partly Kingdom of Italy; between the two World Wars occupied by Germany, Italy, Hungary, and Independent State of Croatia (1941-1945); and the Socialist Federal Republic of Yugoslavia from 1945 until independence in 1991. Slovenia is a member of the European Union, the Eurozone, the Schengen area, the Organization for Security and Co-operation in Europe, the Council of Europe, NATO, UNESCO, WTO, and UN. Slovenia is a highly developed country. The Slovenian head of state is the president, who is elected by popular vote every five years. The executive branch is headed by the prime minister and the council of ministers or cabinet, who are elected by the National Assembly. The bicameral Parliament of Slovenia is characterised by an asymmetric duality, as the Constitution does not accord equal powers to both chambers. It consists of the National Assembly (Državni zbor), and the National Council (Državni svet). The National Assembly has ninety members, 88 of which are elected by all the citizens in a system of proportional representation, while two are elected by the indigenous Hungarian and Italian minorities. Elections take place every four years. It is the supreme representative and legislative institution, exercising legislative and electoral powers as well as control over the Executive and the Judiciary. The National Council has forty members, appointed to represent social, economic, professional and local interest groups. The government, most of the Slovenian polity, shares a common view of the desirability of a close association with the West, specifically of membership in both the European Union and NATO. For all the apparent bitterness that divides left and right wings, there are few fundamental philosophical differences between them in the area of public policy. Slovenian society is built on consensus, which has converged on a social-democrat model. Political differences tend to have their roots in the roles that groups and individuals played during the years of communist rule and the struggle for independence. The Slovenians have pursued internal economic restructuring with caution. With respect to their origin, three main types of cadastre arose in the territory of present day Slovenia in the period between the mid-18th to the first half of the 19th century. They are named after Austrian emperors and empresses. They are the Theresian, Josephine and Franciscan cadastres. The Theresian cadastre was primarily characterized by the fact that the land was not surveyed, but rather its value was merely estimated. In 1747 Maria Theresia issued a patent which created an inventory of land in terms of the type of ownership, differentiating between the noble or dominical and peasant or rustic holdings. The Josephine cadastre was created approximately 30 years later. Its main characteristic was that the land was surveyed using the prescribed surveying tools (a wooden surveyor’s rod, a surveyor's chain, two wooden stakes and 6 to 8 wooden poles). The Josephine cadastre was the first one to determine and mark the municipal boundaries, the newly determined place names and the added field names. The land yield estimate was implemented using uniform criteria with respect to the land fertility. The patent by the emperor Franz Joseph I on 23 December 1817 played a key role in introducing a stable cadastre in Austrian lands. The land survey was based on the latest surveying achievements. The surveys done with surveyor’s tools (a surveyor’s table, a dioptre with a ruler, a plumb bob, a level, a field compass, a set of pairs of compasses, a linked chain, marking flags and targets) were performed by trained surveyors. All measurements had to be linked to the mathematically and graphically determined points of the trigonometric network. In the territory of the modern-day Slovenia the graphic method surveys were implemented in the period between 1818 and 1827. The basis for the survey of our territory was provided by three coordinate systems. For the Styria region the point of origin was in Schöckel, for Carniola, Karinthia and the Littoral region the point of origin was on Krim and for the Prekmurje region the point of origin was on the Gellert hill. The first land cadastre maps for the Slovenian territory were created mainly at a scale of 1:2,880. As they were not updated, in time they became outdated. The revision, carried out between 1865 and 1882, systematically discovered all the discrepancies between the situation on the map and in the field. 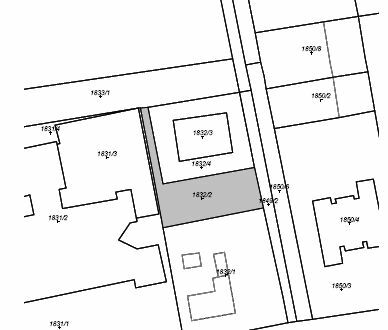 Necessary surveys were carried out and cadastral maps updated and re-printed. Since 1883 the Land Cadastre, representing the technical section, and Land Registry, representing the legal section, have been regularly updated. The cadastral maps created on the basis of this survey are still in use for the majority of Slovenia. The attribute part of the Land Cadastre started being administered in digital form in different coordinate systems in 1979, while the uniform administration for the entire country started in 1988. The first topologically accurate digital maps were created in 1991 when the modernization and updating of the Land Cadastre began. The project took place between 1991 and 2002. It was implemented in several phases – from the preparation of data, data acquisition (scanning and vectorisation) and elimination of discrepancies after the acquisition, to the transformation and the adjustment of the boundaries of the acquisition areas. Concurrently, new survey methods appeared. They were implemented by the Surveying and Mapping Authority of the Republic of Slovenia through implementers selected through public tenders. The surveys were co-financed by local communities. Since 2006 we have stopped implementing surveys of such scope as they are not financially feasible. We are, however, searching for other methods of improving the positional accuracy of the graphic part of the Land Cadastre. Land book (registry) at Supreme court is responsible for registration of real property rights in Slovenia. http://www.sodisce.si/vsrs/ Supreme court is independent body, but organizational and operational questions are carried out by Ministry of Justice. http://www.mp.gov.si/ Land book (land registry) are organized at district courts at 44 locations as evidential department at district courts. Private entrepreneurs and enterprises fulfilling the requirements for implementing land survey services provide Land survey services. Land survey services comprise: the implementation of the procedures for the preparation of studies and the production of studies pertaining to boundary settlement, new surveys, percolation, land consolidation, boundary adjustment, determination of land under a building, production of studies for building registration, change of actual use of land, change of land rating, cultures and classes of land, boundary settlements between self-governing local communities, production of studies for registering buildings and parts of buildings into the Building Cadastre, production of studies for registering the change in data of Building Cadastre and the production of a technical report on boundary marking in the field as well as individual assignments pertaining to real property registration. Slovenian Chamber of Engineers (IZS), Section of land surveyors (MSGeo, http://www.izs.si/ (270 members). In Slovenia is established a system with licensed surveyors. Surveying company must got an permision for work land survey service. For each land survey service the surveying company must appoint a responsible land surveyor fulfilling the conditions under the law governing the land survey activities and the project designer must appoint a responsible project designer who fulfils the conditions under the law governing construction. Annually some 40 students graduate at high technical program and 35 at university study program (http://www.fgg.uni-lj.si/ogeo/). Land register and cadastre are fully independent in organization, personal and financial matters but they are unified in a connected data base. Each land register office and cadastral office maintains the data (within its jurisdiction in the data base. The technical support of this central organized data base will be fully automated in next few years. All information in the records is fully open to the public. There is an open access to the information by using modern web based services. All land book courts, cadastre offices, notaries, licensed surveyors, banks and many others have online access to the database. The Land Cadastre is an official record of land properties. Land property is a land parcel. The basic unit of the Land Cadastre is a land parcel, which is an undivided land property, located within one cadastral area and registered in the Land Cadastre as a land parcel with its parcel number and its boundary. The Building Cadastre is a record on buildings and parts of buildings. A building is a structure one may enter and is designed for one’s permanent or temporary residence, conducting a business or any other activity or providing a shelter and cannot be moved without damage to its substance. A building has one or several parts. An individual part of a building is a space or several spaces in the buildings which can be independently legally managed. The common parts of the buildings are also registered into the Building Cadastre if they have been designated. All data are maintained at national level. The basic records on land and buildings are the Land Cadastre and the Building Cadastre. They are linked with the Land Register. The Land Cadastre consists of the latest recorded data on land parcels and the collection of documents and data which enable a historical overview of changes. The identification marking comprises the parcel number and the cadastral commune code. It is administered within one cadastral commune. The land parcel boundary is defined by several straight lines which connect into a polygon. The parcel surface area is calculated using the planar coordinates of the land cadastre points which define the boundary in the field. Land Registry unit serves as a link between the Land Cadastre and the Land Registry. The Building Cadastre also administers the data on links to the Register of Spatial Units (address), the Land Cadastre (land parcel) and the Land Registry (Land Registry unit and subunit). A digital land cadastral representation of land parcels was produced for the entire territory of the Republic of Slovenia. It is regularly updated and it shows the actual parcel situation. The data are available to the users in standard formats (shp, dxf and ascii). There is an active online portal where graphic and attribute data can be accessed. Cadastral maps were produced for the entire territory of the Republic of Slovenia. Most of the graphic maps were produced at a scale of 1:2,880; in cities/towns and densely built-up settlement at 1:720 and 1:1,440 and in the mountainous areas at 1:5,760. The maps created in the last seventy years were produced at 1:1000, 1:2000 in 1:2500. All the cadastral maps in the archive were scanned and are available in digital form as raster images. Altogether there are 110,000 maps. Currently being prepared is the central database of the archive of the cadastral maps, which will enable the examination of maps through the online portal. The parcels in digital (vector) form are recorded as topologically accurate polygons. Each polygon has a centroïd with a parcel number. The administrative unit is a cadastral commune, within which land parcels and land cadastre points are uniquely numbered. Land cadastre points and settled boundaries are shown in the graphic part through tables (dbf). Land cadastre points represent polygon bends. For land cadastre points we administer data on the number, the coordinates, the method of designation, the method of marking the point in the field, the coordinate accuracy, the status, the procedure number and the date of change. In 2008 we established a new national coordinate system, which is divided into two components: the horizontal and the vertical component. It is marked by a D96 suffix. Until all the technical requirements which allow the administration of all spatial data in the ETRS96/TM coordinate system have been fulfilled, we will be presenting the data in the D48/GK system. The new name, the Transverse Mercator cartographic projection, was also introduced in order to indicate with the name itself which planar coordinate system it is. Cadastral and real property information and other information produced and distributed by Surveying and Mapping Authority are an integral part of the national and European spatial data infrastructures. The Surveying and Mapping Authority and Land Registry in Slovenia face huge challenges resulting from technical developments world wide and from the political changes taking place across Europe. More and more legislation produced by the European Union is affecting the work of Land Cadastre and Land Registry. Cadastral and land property information is required by the INSPIRE directive that creates obligations to the Member States to create access to national spatial data infrastructures. The Land Cadastre, the Building Cadastre and the Land Registry are currently not automaticaly electronically linked; therefore data exchange takes place through issued documents (decisions, notices, etc.) and direct access to data (through online applications). In 2009 we are going to begin linking to the electronic Land Registry. The biggest problem is not enough modernized existing technical solutions and aspects (data model, process model and metadata). Next problems are related with data quality (positional accuracy of graphical part of digital land cadastre). This modernisation of information solutions will be realised within project called eSpatial in period 2016-2020. In order to enable electronic access to data the Surveying and Mapping Authority of the Republic of Slovenia established an IT-supported distribution system, which is a part of the national information system at the Ministry of Public Administration and which is updated with a one-day delay from the central database. The Surveying and Mapping Authority of the Republic of Slovenia and the Supreme Court are involved in the Project to establish information cohesion between real estate records – the Land Cadastre, the Building Cadastre and the Land Register. The project has already produced a protocol for the exchange of data between these records. The protocol contains the list of procedures for individual records, identification markings, the method of data exchange, more detailed protocols and methods of data alteration, registration of data into the basic real property records and their harmonization. Modernization of technical aspects (data model, process model and metadata), IT-tools and marketing for brought use of these information as part of an information infrastructure provided by the government (eGovernment).